What is the book in a digital age? Is it a physical object containing pages encased in covers? Is it a portable device that gives us access to entire libraries? The codex, the book as bound paper sheets, emerged around 150 CE. It was preceded by clay tablets and papyrus scrolls. Are those books? 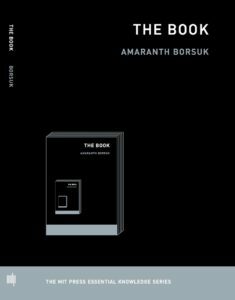 In this volume in the MIT Press Essential Knowledge series, Amaranth Borsuk considers the history of the book, the future of the book, and the idea of the book. Tracing the interrelationship of form and content in the book’s development, she bridges book history, book arts, and electronic literature to expand our definition of an object we thought we knew intimately.